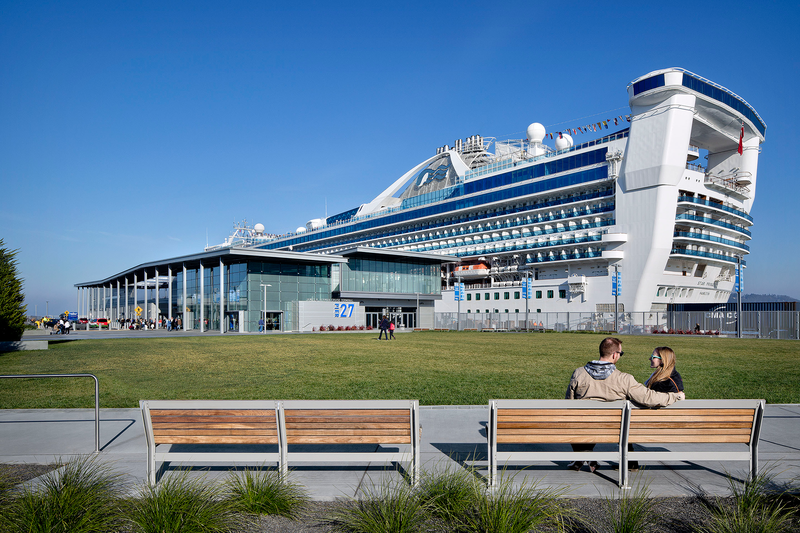 This large scale civic project transforms a seven-acre waterfront Pier 27 structure in San Francisco into a modern cruise ship terminal with an adjacent public park. The site engages the Embarcadero, offering significant public access to the waters edge and provides an important new civic connection to the Embarcadero promenade experience. The project includes a new 90,000 gsf sustainable cruise terminal facility for up to 4000 passengers, providing a pleasant arrival and embarkation experience for passengers throughout the year. The program of the building addresses the critical long term needs of the international cruise ship industry and allows the Port of San Francisco’s terminal operations to be responsive to those needs. The terminal structure and site features also address the security concerns of the U.S. Customs and Border Protection, as well as Homeland Security, offering the ability to secure large areas of the site when ships are in port. When the facility is not in use for cruise ship arrivals and departures, the building is designed to be used as a flexible “for rent” space for a variety of events. Design improvements to the two-acre “valley” area in the center of the site offer structured access for ground transportation on cruise days and accommodate various temporal “urban activation” uses the rest of the year. The first phase of this project, including the terminal structure, was completed in May 2013 to become the “Race Village” for the 2013 America’s Cup Finals and the Challenger Series. The second phase will be completed in late 2014 and includes all the site features, as well as gangway structures and other elements critical to the terminal operations. The project embraces sustainable building strategies, including providing green power for the cruise ships while they are docked and was designed to meet LEED silver. The James R. Herman Cruise Terminal at Pier 27 is the product of a successful joint venture between Pfau Long Architecture and KMD Architects; the team worked with multiple San Francisco agencies including the Port of San Francisco, DPW and the city of San Francisco.